To design a flat slab with a column head, or a flat slab supported by columns with large dimensions compared with the thickness of the slab, it is recommended to use some specific measures. For the column head case, the column head is defined similar to the drop panel (to avoid superimposing the column head over the slab, there must be holes created in the slab; there must be some other thicker slabs created inside these holes, that will act as the column head). In this example, the column section is 40 x 40 cm, the column head dimension is 100 x 100 cm and the thickness is 40 cm. The large column has the section dimension of 100 x 100 cm. In both cases the slab thickness is 15 cm. A line must be defined over the column head perimeter . For the large columns case, this line will be created over the column perimeter. To obtain a better precision for the results, the mesh element size is set to 0.10 m.
After the mesh is done, the behavior of the slab mesh nodes above the column or column head must be defined. The finite element mesh node behavior must be identical with the behavior of the mesh node from the upper end of the column. To define this behavior all the mesh nodes inside the contour lines must be selected, and the "Create DOF constraints on selection" command must be selected from the context menu. On the command line the "Select or input the master node" message appears. 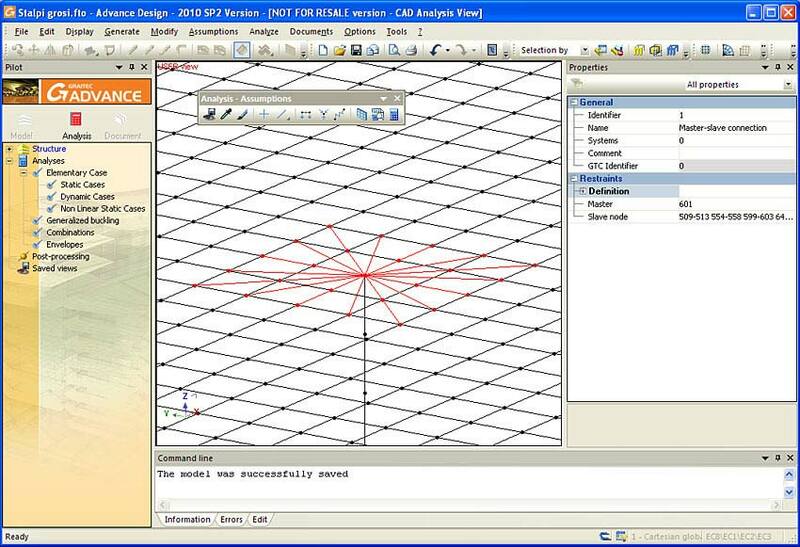 The mesh node from the end of the column must be selected. The displacements and the rotations of the master node (Tx, Ty, Tz and Rx, Ry, Rz) are set to all slave nodes through the created connections. If the connection network is selected, in the "Master-slave connection" properties all nodes can be easily identified. In a similar way a "Master-slave connection" must be created and defined for all the columns. 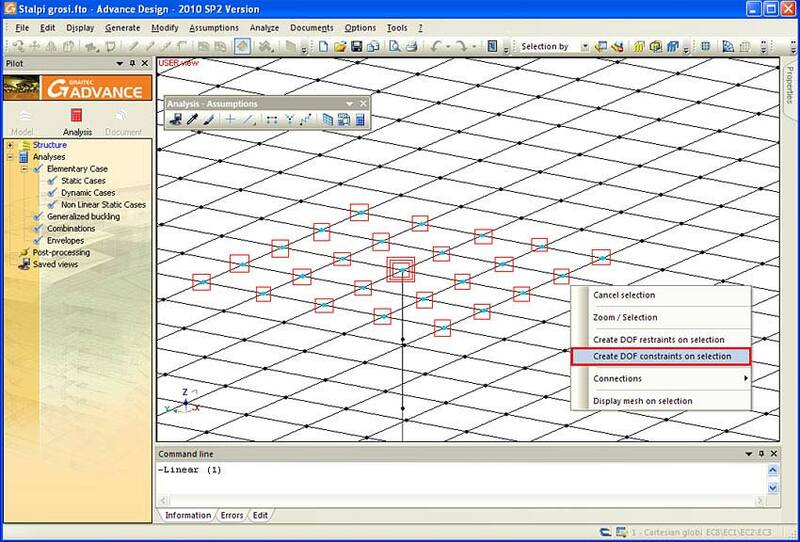 To define the displacements or the rotations that are set from the master node to the slave nodes, select the "Master-slave connection" and from the properties bar select the desired Degrees Of Freedom (displacements and/or rotations). In this example all the Degrees Of Freedom are selected to be transmitted from the master node to the slave nodes. Over the slab, a uniform distributed load of 10 kN/mp is defined. After the model is analyzed, the displacement of the slab will be displayed to show the influence of the "Master-slave connection". Displacement diagram for a slab with column head. Displacement diagram for a slab supported on large columns.